Syllabus – Gretchen Kreahling McKay, Ph.D. Since the start of this new year I have been caught in a wave of interconnected issues that have pulled social systems and problems into my little corner of academia. I have been observing, watching, and listening to my students for some time now, realizing that familial, cultural, and societal pressures can often interfere with their learning. But this week a lot of it all came to a head. And it is making me think, and it is making me wonder if my role as an educator is shifting. Should it shift? I helped four students this past week who were academically dismissed because of their GPA and credits earned. It's a formulation. The people who made the decision were following the guidelines. And that is why there is an appeal process: the student and I can provide context for the reasons that the GPAs dip. And the reasons are all over the map. Depression. Family health issues that required the student to commute home and balance school priorities. Undiagnosed ADHD. Being in the wrong major. Twice. And those are just some of the reasons. I am happy that all four of these students asked for my help, and let me help them. Because through that process I am learning a lot. I had to find out a little about their plans to pay for college. That led me to read, yesterday, in one sitting, Sara Goldrick-Rab's Paying the Price, published by the University of Chicago Press. This book chronicles the story of several students that were tracked in the Wisconsin system of public higher education. I teach at a private school. Nevertheless, it was a gripping read, and it was sad to see how many students did not make it to a degree. "Any student who faces challenges securing their food or housing and believes this may affect their performance in the course is urged to contact the Dean of Students for support. Furthermore, please notify the professor if you are comfortable in doing so. This will enable her to provide any resources that she may possess." Part of me can't believe that this would be necessary. And yet I see it with my students. Students tell me that they can't afford the book for a class that is over $300. Or the code for online homework that is nearly $200. I don't know how many, but we do have students on our campus who are homeless. Students struggle to pay their tuition bills, often knowing that they can't register with their colleagues because of a bursar hold, and having to hope that the classes that they need will still be open when they finally scrape up enough money to get through another semester. Some of my colleagues scoff, and say that these students "find the money for beer." But I am not so sure that these students are doing this. They have too much riding on the line. They are have at least one part-time job. They are trying to make headway with their GPAs and grades. They are trying to find a way to do an internship that will still allow them to stay at their part-time job that they need have in order to pay the bills. With all of this staring me in the face, I can't turn a blind eye to it. My role as an educator needs to shift. But what do I do? How does that role shift? I open this up to discussion, especially among my faculty colleagues. What do you feel your role is when you see inequities or needs among your students? Do you do anything? If so, what? Do you feel like it is none of your business? Students - what do you need - or not need - from faculty when you face difficult social or personal situations? Maybe you want us to back off? I hope to start a conversation about all of this in the comments. Author Gretchen McKayPublished on August 2, 2017 2 Comments on What is the Point of the Syllabus? I am required to have a syllabus for every course I teach, even though online or hybrid/blended courses don’t need the traditional syllabus because of the way that course guides and modules are set up if you adhere to best practices in online education and teaching. But I make one anyway, and link it on the content management system page for my courses. And there is language I am required to put on the syllabus, though I have heard of some faculty making that an appendix and putting it on their course management page, which is an interesting idea, to keep the syllabus about the course. But as Singham notes, where in the syllabus is learning addressed? I have attempted to add learning goals to the syllabi for my classes. And Fulmer's point is about creating syllabi that are more learner-centered rather than teacher-focused. In other words, we can make syllabi more collective in spirit – about what is possible in the course – rather than generate a list of rules that indicate how a student can lose points for every possible misstep. In my attempt to make my syllabi more about learning, I include a section about my learning goals for students in my course. After going over those on the first day, I pause to have students fill out a card that notes what they would like to focus on for learning in the course. I (try to remember to) give out those cards again at the mid-point of the semester in order to have students note how they think they are doing on their goals, which gives me a chance to respond in kind to them about whether I agree with their assessment of their progress or not. I think this is a great chance for individual feedback to students about how they are doing in my class. I was also struck by a column in Chronicle’s Vitae the other day written by David Gooblar, which advocates putting more images in a syllabus, almost making it read like a graphic novel. You can read that post here. I'm an art historian. I should find ways to "art-up" my syllabi, and may do just that this August. 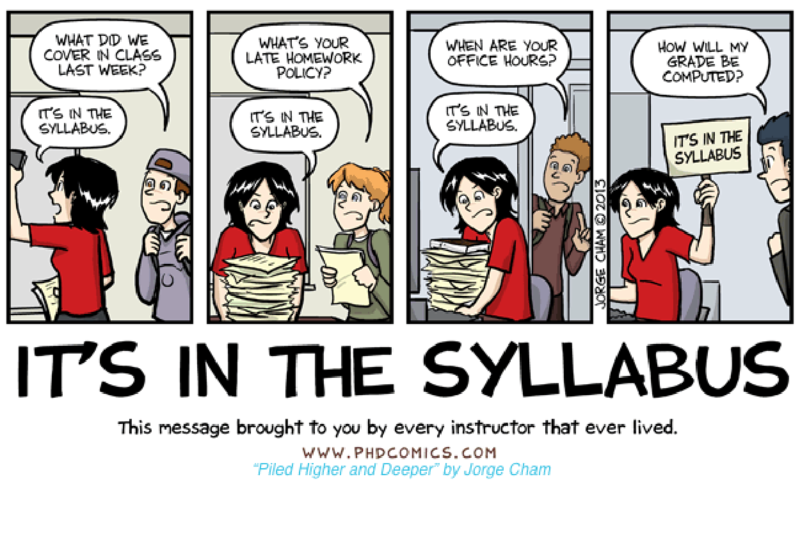 Faculty: What do you think about your syllabus? Do you want to change it up, or is it a list and a contract that sounds more like legalize? Do you want to keep it that way? Do you feel at your institution you have to? 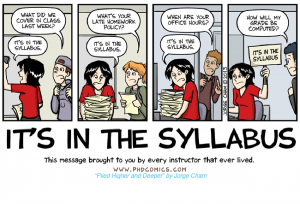 Students: what say you about the syllabus in a course? Do you read it? Why or why not? Published on August 2, 2017 Categories Syllabus, TeachingTags faculty, highered, sylalbus, teaching2 Comments on What is the Point of the Syllabus?